We can live like Jack and Sally if we want"
okay, tell me why I end up singing? Oh maybe because it was just me, lel. SO, where do I start? Basic question as per usual.. 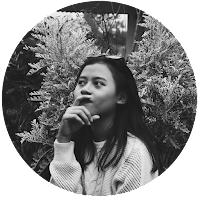 I'm so sleepy in this 11 a.m and got nothing to do here in Mbah's house, so here I am, again apologizing to you and my self that I just find a decent time to swish the dust out of my blog, lol. Well, how was my June? It's already in the end of June and nothing went quite marvelous. June has always been my favorite month to spend, but let me did a little throwback of how my June on this 2017 went. Well, I have always been excited when June comes, but not this year. Quoting from my tweets, I still love how June finally be here, but since it means that the deadline also coming closer, it means that we had to work on our assignment much harder. And it was indeed tiring and pressuring. I've been working on my research thesis since May (because I just got back from Tangerang on the end of April after spending a whole month of March 22 - Apr 25 in ma hometown due to the our grandfather passing away). And also I took it as a rehab after my KKN done, lel. I missed my family much. Busy working our asses off and managing to get our nerves on track, since I got my seminar schedule on 21 June. I was no longer complaining whether we should take the seminar schedule after Eid Mubarak, because since its getting closer to the reality, and since there are things you can't change and can't control, so its better if we prepared ourselves for the best instead. My mind was full preparing on my seminar, moving out from my last dorm room, and then Eid Mubarak, I forgot it was actually getting closer to my birthday. And here I am, either telling and complaining of how I would spend my day today, on this last day of June already. Apparently I want to get back achieving my sims dreams, but I got caught up on my blog and decided to put some life update on it.